To meet the evolving needs of workers and visitors in the core of Cape Town, a new food concept has been pioneered under the “Food Lover’s Market” label. The modern eatery concept brings together the best of an urban grocery store and food court within one beautifully designed facility. Importantly, centralized point-of-sale tills allow visitors to effortlessly grab a mixed basket of prepared take-away food and grocery products. While many grocery stores in urban locations have been expanding their grab-n-go offerings, Food Lover’s Market takes the essence of this concept to the next level. Fresh produce, a make-your-own fruit salad bar, and a bakery provide some of the healthy food options, but are perhaps offset by the adjacent doughnut deli. 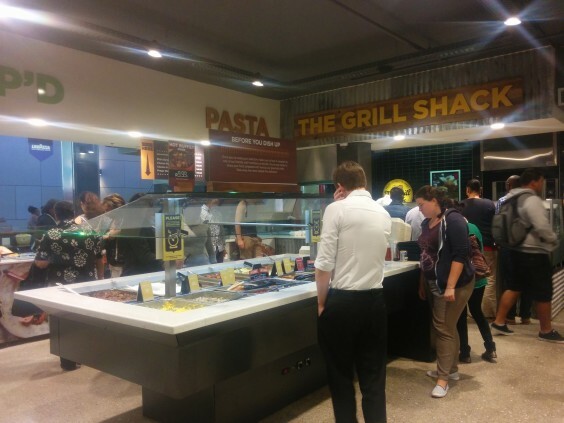 Cheeses, biltong (cured meats), pizza cooked on-demand, fresh sandwiches, the “grill shack” that flips up burgers, and an impressively large self-serve hot deli and salad bar provide enough variety to keep customers coming back daily. If this variety wasn’t enough, the 10% discount for holders of their membership card program certainly helps turn one-time visitors into regular customers. Once items are purchased through the centralized point-of-sale, customers can choose to linger in one of the many available seats or take the food off-site; potentially to the attractive pedestrian-only St. Georges Mall that runs adjacent to Food Lover’s Market. Our favourite aspect of this particular location, however, is the modern high-end gym with floor-to-ceiling glass located immediately above the main entrance and eating area of Food Lover’s Market. Exercising and “healthy” grab-n-go food complements one another so well it’s astonishing they aren’t brought together more often. For the busy office worker trying to sneak in a quick workout at lunch, it’s a breeze to pop by Food Lover’s Market after. Best practices like Food Lovers’ Market have a lot to offer in planning for the next generation of urban eateries!